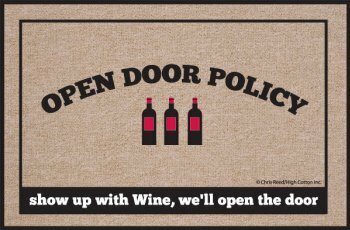 Mat measures 18" x 27"
High Cotton Doormat: Open Door Policy; Show up with Wine, we'll open the door. Humorous, durable doormat. Perfect gift for wine lovers! Manufactured in USA. 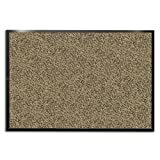 100% Olefin Indoor/Outdoor Carpet. Washable with hose & brush. Dry flat. Perfect bound stitched edges.